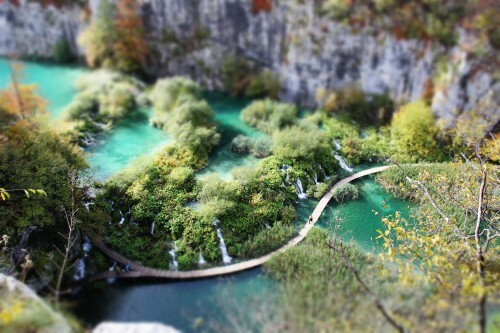 Plitvice Lakes National Park: Middle Earth as we know it. Normally I would consider it to be extremely rude to talk about the beauty and majesty of a place that not everyone has seen for themselves but I would be doing you a disservice if I didn’t croon about the grandeur that is Middle Earth Plitvice Lakes National Park. The truth is, as travel bloggers, inspiring others to see a place for themselves is actually the business that we’re in. Chris and I try to find the beauty within every destination that we visit. That might come in the form of its people, its landscape, or even the delicate taste and depth of its food. Sometimes it’s a stretch and sometimes it backhands us right in the kisser. Plitvice Lakes National Park did the latter. It literally curb stomped our faces into its splendor. What makes Plitvice Lakes National Park so special isn’t that it’s the oldest national park in Southeast Europe or that it’s the largest national park in Croatia. Founded in 1949, this park reminds us of a world that we would find in a Tolkien novel. The vibrant colors of the changing autumn leaves greeted us as we stepped foot inside the park. As if welcoming us with a grand of gesture as possible, a huge cascading waterfall stood in the foreground as we entered. I immediately turned to Chris and told him that I felt like we were in Middle Earth. The only thing that would have improved the scenery was if Aragorn escorted us in himself. Our greeting to Plitvice Lakes National park. Gross, right? Elves and hobbits could have been a normal sight amongst the majestic turquoise pools that cascade into one another. 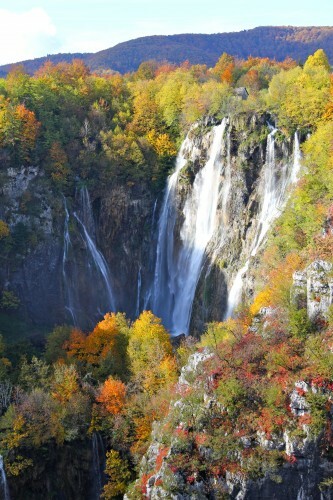 The beauty of Plitvice lies in its 16 visible lakes that run into each other causing the appearance of steps. Visitors to the park can walk on the wooden foot bridges that wind around the lakes and stop at numerous waterfalls. Below are the gems of Plitvice Lakes National Park. I mean, come on. It’s stupid pretty. While Plitvice Lakes National Park was a delicious slice of heaven, it is Rastoke, the whimsical town a few miles away that is the icing on the cake. Chris spotted this gem from the road and at first glance it appears that it’s a town built upon waterfalls. The mist from the cascading falls hit the fading sunlight and form an ethereal halo that surrounds the town. 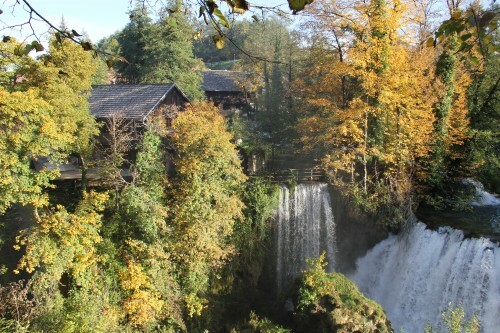 This watermill village is situated where two rivers copulate and create beautiful waterfall babies (each with its own name). Our first peek at Rastoke. Le gross. We spent some time wandering around Rastoke dragging our jaws on the ground. Around every corner was another awe inspiring view that I can’t even begin to put into words. This place was the closest to heaven on earth that I’ve ever come across. The bonus? We were there in the off season and there was barely another tourist in sight. My only regret is that we didn’t get to spend more time exploring this idyllic paradise. Chris and I are already planning a trip back for our one year anniversary. If you find yourself in Croatia, do yourself a favor and stop in to Rastoke. You won’t regret it. Where is your heaven on earth? Let us know in the comment section below. Like what you’ve read? Check out our new posts on the Expedia Viewfinder Blog. We were guests of Croatia courtesy of the Croatian Tourism Board and DQMPR. It shouldn’t have to be said, but all thoughts are our own and we really, really loved our time in Croatia. My head fell to my desk followed by snoring after seeing these pics. So BOOORING… not. Plitvice will be one of my top things on my list to see when we visit the country of Croatians. There are no words. Totally amazing. I agree there is charm in every destination…. but sometimes it is just SO easy to see… Like here. Wow. 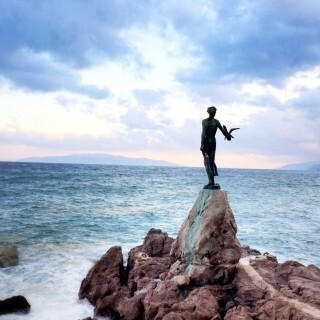 And this is not the Croatia i think of when I think of Croatia… Thanks for the education. Ps – love the captions on the photos. UMMMMMMMMM…. after I picked up my jaw from the floor, I took a moment and went back through the gorgeous images. 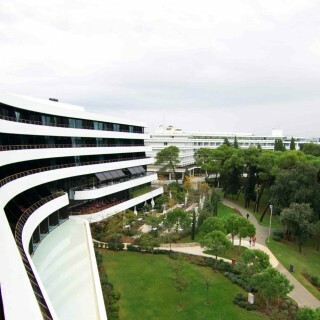 A trip to Croatia is in the near future for me, so thank you for showing me where to go. Wow, what a beautiful spot! I have only been to Dubrovnik and this makes a clear case that there is a lot to discover in Croatia. STUNNING! I’ve wanted to visit Croatia for at least a decade. Your description and photos are just part of the reason why. Gorgeous! 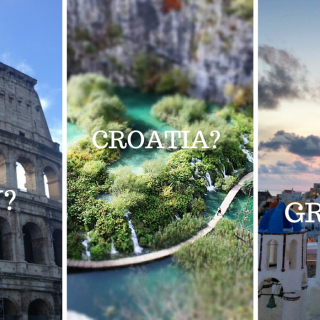 I loved following your Croatia trip – you did go to some amazing places. Love the photos and can’t wait for more posts! how GORGEOUS! stupid pretty is definitely the right word! Wow – just stunning! My grandfather was born in Croatia, but pretty far north, so I’ve been, but only to his town and the island he’s from. 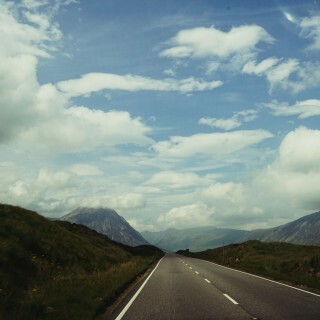 Clearly, I need to get back there asap and visit Middle Earth. Gorgeous, just gorgeous! I could not believe this place existed on Earth when I first saw photographs of this fairy tale like national park. The photos seem even more amazing with fall colors surrounding the waterfalls. It is almost too much visual sensation. Just beautiful! Lots to see in the Balkans for sure. I’ve only been to Zagreb in Croatia, but perhaps I’ll be back to check out more regions. 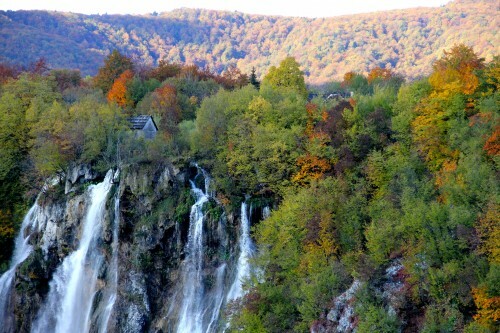 I love how you compared Plitvice to Tolkien´s Middle Earth! :) Absolutely fitting! I´ve only been to Dubrovnik, which is the most obvious tourist destination in Croatia, I guess, but soo beautiful anyway..definitely need to pay Croatia another visit and see Plitvice Lakes this time. Your pictures seem to compliment the beauty of this place even more, they´re breathtaking! I was also mesmerised when I visited Plitvice this summer. Unfortunately, that was at the height of peak season so there were waay too many people. And I didn’t see Rastoke either! I’ll be back for sure though – Croatia does that to you. Plitvice lakes are amazing. We were there 2 years ago and really enjoyed the day there much more than spending it on the beach. Lovely photos, thanks for sharing. Wow – the pictures are amazing. I had not heard of the park before – thanks for the introduction! Great article and a great description. I have now been here three times from Australia and it would have to be one of the best natural experiences one could imagine. It is not just a site but a place you can spend all day walking around taking photos and gawking at the beauty. We took the six hour trail and it was amazing. I can’t believe you have discovered my hidden gem of Rastoke in Slunj region. I stumbled across this place on Google images and made it my goal to visit this year as is only forty minutes up the road towards Zagreb. A stunning little town built on top of waterfalls- so fairy-tale like. I have now travelled this beautiful country from top to bottom as I like you am obsessed with its beauty. I can understand why it has been through so much political turmoil and wars(it is so beautiful everyone wants it for themselves). If you get the chance check out some more of my little Croatian secrets- you will thank me for this : ). Town of Sibenik(visit solaris beach and restaurant called etno selo which is not to be missed). Krka Waterfalls(enter from town of Skradin)- Bill Gates favourite but still relatively undiscovered. Vodice town and Island of Murter(day trip to Kornati Archipelago and Telascisa), Town of Primosten. These place just mentioned are in central Croatia so easy to travel to in one trip. The following are further South. Towns Brela & Baska Voda and lastly the island of Vis. I recommend travelling here in the last two weeks of June or the first three weeks of July to get the most out of your experience. Just before peak tourist season starts but everything is already fully functional due to the nice weather. I love Plitvice! If you go to the see along the old road, you will go directly through this beautiful place. I think everybody will enjoy stay in Plitvice. I’m glad your writing down the places to visit. I know you have been to Croatia in the off season but if you want to avoid the largest crowds and experience the feeling of Summer the first two weeks of July are great as holiday season starts in the third week. 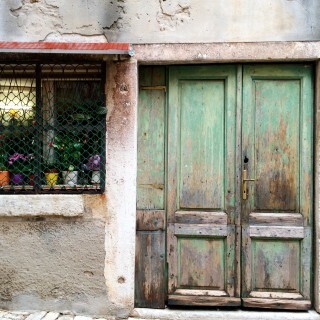 On your way to Vis make sure you visit Bol on the island of Brac and town of Pucisca. Also visit Hvar (a site not to be missed like Dubrovnik) on route to Vis. My last little secret is Stiniva cove on the island of Vis, Once you go here you will be definitely moving to Croatia. When in Dubrovnik area I would recommend staying at Cavtat. Great Blog- keep up the good work.